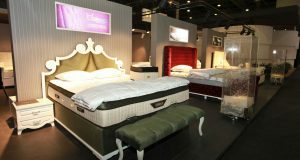 Celebrating its 40th anniversary, Auping has sold over one million Auronde beds and today this timeless bed is still successful with consumers. The design itself has therefore not changed much since the introduction in 1973, retaining its distinctive ‘eye’ and curvy shape. Over the decades, however, new colors, accessories, innovations and the newest techniques have been added. Auping has recently launched a special limited edition to mark its 8th lustrum: the Auronde 1500 linen look. This bed has a linen look surround, combined with the color brick for the inside of the legs, the paneling and the sliding table. Due to this unique design you can add a real eye-catcher to your bedroom. Participated in IMM Cologne this year, Auping introduced a limited edition and added five new, bright colors to the product assortment: the full lacquer colors ‘1973 green’, sea blue, moss grey and deep black, and the wood stain color white. The new product assortment was unveiled at the IMM Fair. With the introduction of the new color palette the Auronde continues to perfectly fit into today’s bedroom. 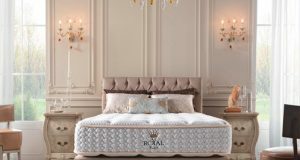 Royal Auping bv is the largest independent Dutch bed manufacturer, with locations in various European countries, including Belgium, Denmark and Spain. Auping began 120 years ago as a smithy in Deventer and quickly specialized in mesh bases. 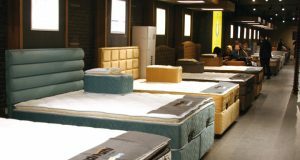 Mattresses and box springs were later added to the collection and made Auping into the sleep specialist and market leader in the Netherlands it is today. The starting points for developing the beds are the three pillars that make an Auping night so special: ventilation, support and pressure relief, so that Auping nights mean Better days. Auping works together with researchers and renowned designers such as Frans de la Haye and Thomas Althaus. The craftsmanship, dedication and expertise of the Auping staff guarantee durable quality and a high degree of service. A select number of top hotels in the Netherlands and beyond are furnished with Auping beds. The Essential by Royal Auping is the first bed in the world to be awarded a Cradle-to-Cradle Silver certificate. This label guarantees that the bed is from at least 50% recycled materials, or materials that are recyclable. The newmattress range has also been awarded this certificate. Auping has been working on corporate social responsibility (CSR) for many years. We are constantly aware of the impact that the production of our beds has on the environment, and we do everything we can to preserve the environment for future generations. That’s why we choose to use responsible and safe production methods and use environmentally friendly materials wherever possible (such as water-based paints, CFC-free foam and PEFC timber). 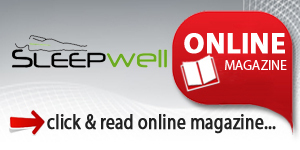 We at Auping see sustainability as one of the strategic pillars of our business operations. But we like to go the extra mile in taking our responsibility. That’s why Auping was the first Dutch bed manufacturer to choose Cradle to Cradle®. Cradle to Cradle® Cradle to Cradle® is also known as C2C®. The C2C® concept means there is no such thing as ‘waste’ in the sense of ‘throwing away’ anymore, but rather an endless cycle of materials. These materials are fully biodegradable and 100% recyclable into a new version of the same product or a product of higher quality. This means that waste acts as a raw material, or rather waste = food. The challenge for businesses is to reduce their waste and pollution, with ultimate goals including 100% recycling and implementing processes in such a way that they provide environmental and social value, as well as economic value. Nature is seen as the inspiration for effective, safe, enriching and aesthetic designs in which natural systems such as solar energy and diversity play an important role. Cradle to Cradle® in practice at Auping A project aimed at implementing Cradle to Cradle® across the organization isn’t going to happen overnight. It is an integral process which we must focus on continuously from now on – not only in our production methods and materials, but also in our working environment: in both the factory andthe office. The first steps have already been taken now that our new mattresses, the Essential bed model and the flat mesh bases have all been awarded C2C® Silver certification.